Digital being the time we live in, it goes without saying that probably the word “emotion” has disappeared from our lives. Being surrounded by electro-magnetic waves and machines we have gradually evolved to be “machine-made man”. But do we ever think that without our heart we don’t even survive, then how is it possible that we don’t implement its importance even in our business. Yes…I am talking about emotions. It’s real vital in todays’ time that we are always emotionally connected with our audience. Because without it, anything is nothing. When you are writing on the web – either in a blog post, or other forms of content marketing, there are high chances that your would likely respond to your offers of the services or the products if a resonance is there between you and your readers. 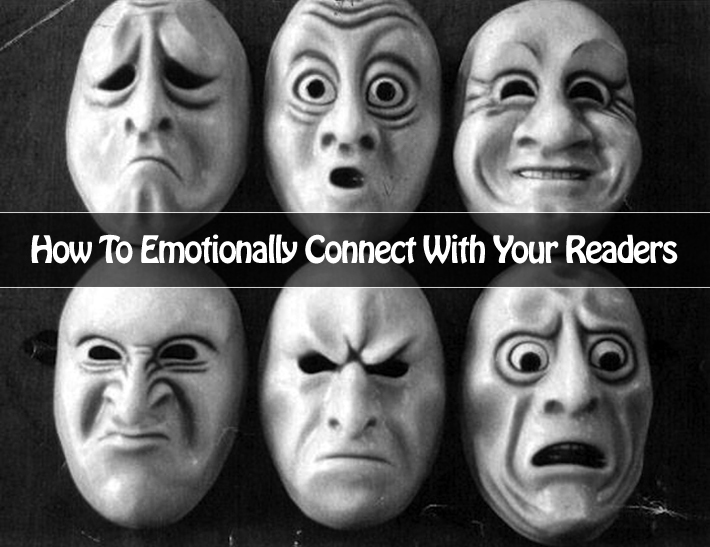 An emotional connect is evolved when your reader experiences being on the same page as you. Yes try to emotionally connect with your readers. To begin with follow the below mentioned rules, although I might have missed many others, but these are I guess some of the very basics which we need to keep in mind. Whenever I come across any new blog, the first thing I ensure to do is to find out something about the author/owner. Many times I have lost track on the number of times I’ve come across a blog and the owner is completely camouflaged. The posts are made by “Admin” and the “About” page has nothing on even at times there is no “About” page at all. Blogging is a very personal medium which defines trust. If you’re starting a blog then at the very beginning at least, let everyone know your name. And I’m talking your real name, not some pseudo name you use for your other online activities. If you want to give more than your name, like where you live and what you do, that’s even better. Generally it is found that the more information your provide about yourself, the higher is the trust level and emotional connection you create with your audience. If you really want your readers to connect with you emotionally, then put a picture of yourself. You can provide pictures which shows you in different angles thus people come to know more about you as a person and they feel closer to you. People love putting names to faces and posting a photo shows you’re a real person.I understand that some people have security concerns about posting their photos online but that shouldn’t be an issue. Chances are there are photos of you online already. You’ll be really amazed at how many people don’t know their mug is on someone’s Facebook page. A picture is worth a thousand words. Showing your face to your readers will greatly enhance your ability to connect with them. If you want to go beyond the picture, then you can show a video. They’re indeed worth a million words. By now, you’ve probably figured out that the more information you provide about yourself, the more emotionally connected you’ll be with your readers. This is where narration of your story will really make a big impact. Describe how you have started your business and have come so far. I know that the post showing the lanes where I grew up created a huge emotional response and this is kind of connection that makes my blog unique from everyone else. The most common place to tell your story is in your “About” page. Aside from your blog home page, your “About” page will be the second most read page. It will also be the page where you can create the most emotional relation because it will all be about you. So ensure that you have an “About” page. Don’t assume that your story is boring and that there’s nothing to tell, leave it up to your readers to decide that. If they’re interested in your blog, it means they are interested in you. So let them know who you are and where you’ve hailed from. Once your readers are emotionally connected to your blog, they will reach out to you. When they do, it’s very important to reciprocate and interact with them. If they post a question in your comments, then please without a second thought answer it. That will create trust and make the connection stronger. I go one step further by trying to interact with my readers face to face. I attend many local networking events and will try organizing a face to face meet up if I’m in a new city. Believe me, once you meet a reader face to face, you’ll have that reader for life. Blog are just one way to connect with your readers. With the explosion of social media, you can now connect with readers on endless number of channels. Making yourself available on these other social network will help to increase the connection you have with your readers. In addition to the blog, readers can connect with you via Twitter, Facebook, LinkedIn, YouTube, Flicker, etc. You should obviously use social media to your advantage. Because the more options you give to your readers for them to connect the more they feel the bonding. In the end, what we understand that by following all these ways you are trying to create a brand for yourself. I’m really stressing on branding because it really adds only advantage. By being completely open about yourself, you will connect with your readers on an emotional level. Once you create that kind of connection, your competition will have a hell of a time trying to break it. Get enough readers to connect with your blog emotionally and you’ll become a brand name. That should be your main target. Be a brand. Milton Erickson is the pioneer of the technique “Pace, Pace, Lead”. He is one of the three therapists whose techniques were used to form today’s NLP techniques. The “Pace, Pace, Lead” technique was Erickson’s primary technique for building trust and emotional connection with his clients. Using this technique, he was able to get even the toughest clients to trust him and open up. Basically, start by pacing, or “following along” with your reader’s emotional state. Listen to their frustrations, their wants, and their emotional frame of mind so well that they feel like you really understand them. Then and only then do you try to “lead” them to where you want to. You have the key to lead them because they will always believe you and trust you with all their heart. Whatever be your principles, your policies, your ethnicity, your religion, always be genuine with your approach. Speak about the facts and figures of your business so that your readers gain the desired faith and trust in your brand. You don’t need to hide yourself, but when you express your individual perspectives, be ready to admit that there are many other people from different backgrounds and different perspectives who might not be in sync with your ideologies. Give them the space to be different yet be connected with you. When you are passionate about what you do, it shows through, and others who experience it can’t help but to feel that passion themselves. Don’t be dull in your posts. Refresh the passion that led you to start your business and your blog in the first place, and make sure that passion shines through in your posts always! Sharing your personal story is also beneficial here. Readers want to know more about you as a person, and learning about what motivated you to create your business can give them an additional appreciation for it to you. In face to face conversation, your body language and facial expressions convey your emotions to other people without you needing to say a word. When you are on phone conversations, subtle variations in your tone of voice give people clues on your feelings, even though they can’t see your face. This phenomenon also exists in writing. Though there are fewer clues to go on, people can sense when you’re genuinely emotionally engaged when you’re writing. If you’re really passionate about a subject, it’ll emerge through. If you’re genuinely angry about an injustice, people can decipher. Your love for a product you’re endorsing will truly shine if it is genuine. Fake doesn’t stand too long. Written communication doesn’t convey emotion nearly as well as face to face communication, but this human-to-human emotional link can’t be ignored, even in writing. Writing to connect emotionally with your readers extracts more dedication and vulnerability on your part. It entails revealing more of yourself than if you were just writing factual articles. But that’s what it takes to build a deep loyal readership. So at the end what we gather from this is you need to inject as much emotion as you can in your writing. Telling different stories, using emotional words and most importantly paying attention to how your readers feel as they’re reading your writing are the little things which you can always do without any presumption. Remember one thing: Keep your writing entertaining and refreshing so that your readers always feel like reading your posts every day. Keep them educational so that every post offers something new to them and they learn. Be the fun teacher everyone loves – Not the boring one which everyone tunes out. If you have some other ideas please share with me as there is no end to learning and sharing knowledge always bounties. Really enjoyed this piece and found it honest and helpful. Thanks for posting it! Thanks Lu! Glad I could help. Gosh, I really don’t have anything else to add. You’ve really covered this topic well. As you probably know, I feel this is very important as bloggers to emotionally connect with your readers. It’s how they’ll get a chance to get to know you as a person and it doesn’t mean sharing your entire life story. But if you give them an opportunity to get to know a little about you then they will be able to view you as just another real life human being here for the same reasons they are. Just from connecting with others I’ve really been surprised to hear how much we have in common when my expectations of who I thought they were or where they were with their business was way off. That really made me appreciate them even more if you can imagine that. We’re all here doing a lot of the same things and it’s those connections we make that will take us much farther. That’s my two cents I’ll add but bravo and thank you Saha. Thanks Adrienne! Glad you liked this article. It’s really good to have you here. I absolutely agree with you Adrienne. Connecting with readers is really necessary no matter I’m contributing on a personal blog or a company blog. Whether it’s a B2B or a B2C business, consumers always like to see the people behind the name or the logo. In my experience I’ve learned that business blogs should use emotions for the right purpose. If one are using it for just sales then it will blow up in their face. This is an incredible information and by the way, I did not know about “Pace, Pace, Lead” method. That is so awesome technique and it does work like a charm! I am completely in sync with what you have shared about each point here. Displaying your name, have a good smiling headshot, sharing your story…. pretty much are the basics for trust building and connecting with the audience today. Giving them an opportunity to connect with you on social media sites is another great step. Hey Kumar it’s good to see you here again! Glad you enjoyed this post 🙂 Surely “Pace, Pace, Lead” technique is one of my favorite. Displaying name & a good smiling headshot is really important for showing the human side of a blogger. I’ve been in your blog lately and I like how you are doing this in your blog in the header section. Thank you so much for your comment and it’s good to see you. I agree with everything you’ve written here. Forming an emotional connection with our blog readers is key to forming mutually beneficial relationships that can grow into new customers/clients. To me, we need to treat our online presence the same way that we approach life in real person. What we do and say online becomes part of our digital footprint and we need to keep that in mind. Thanks for a great post. (Now, I’m off to follow/connect with you. I absolutely agree with you on treating the online world same as our daily life. After all it’s an extension for our extended life. People love, hate, react, make friends just they do in their real life. Loved as you said “What we do and say online becomes part of our digital footprint”. Great post! We connect with people, not brands. More individuals – and businesses – should be embracing this!